When we learn English words in school, we learn what they mean, how they’re used and spelled, but not how they sound. I understand teaching pronunciation is a big challenge. But students should at least be able to tell the words “apple”, “cat” and “camera” have the same sound. So do the words “farm”, “art” and “market”, or the words “run”, “duck” and “blood”. Contrarily, when you say “tennis court”, “fur coat” or “caught a cab”, these three words “court”, “coat” and “caught” do not have the same sound, although they’re often spelled the same in Katakana. And students should be able to tell they’re different. 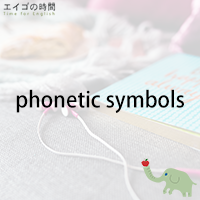 One solution could be to learn phonetic symbols. They tell you the way a word is intended to sound, which in turn helps with pronunciation. Now. Why don’t you try a quiz? You’ll be given three options. Please listen carefully and choose the one that is NOT true. Ready? 1. The words mother, brother, father have the same sound. 2. The words mother, umbrella, apple have the same sound. 3. The words apple, pineapple, sandwich have the same sound.